Confidently make the decisions that will move the needle in your business. Your mindset can’t be automated and you can’t afford to wait. Learn to shift what no longer serves you so you can make room for what works. Get to know me by listening to my podcast, Business Mindset Mastery. Why is "Easy" So Hard? How to Be as Happy as the Influencers Look. "My Biz Bestie is More Successful Than Me"
"Business Isn't My Only Passion"
"Should I Keep My Facebook Group?" Would you Talk to a Child That Way? When Being "Fine" Isn't "Enough"
How to Really "Just Do You"
"I HATE Being the Boss!" "What Should I Be Doing Right Now?" To BOSS or Not to BOSS? "What if I Don't Want More?" Do We Owe Clients Financial Transparency? "My Client is a Bully"
"I Failed the Required Exam 3x"
Are We Going About Happiness All Wrong? What if I Can't Handle Entrepreneurship? Do We Really Owe Our Audience Transparency? How Personal is Too Personal in Business? Are You Compromising Yourself Away? Can I Profit from Others' Pain? When You Lose Your Drive: What Next? How to Shut Up the "What Ifs?" Does My Business Have to Grow? I Have ADHD. Can I Own a Business? After Brave: Who Are You Now? Help! I Got Offered A Job! So, You Want a Business, Huh? Quit, Pivot, Stay the Course? Too New to Own a Business? Do You See The Green Lights? Look Back. Just Don't Stare. Are you good with you? "Is that even a real job?" Why is ambition a dirty word? Heather is the entrepreneur whisperer. She really gets us. 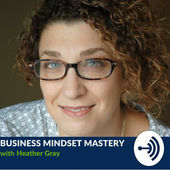 I have worked with Heather personally and, for two years, Heather also served as the mindset consultant for the members in our coaching community. Heather has the experience and training to back what she says. During crossroads in my life and business, I talked about real things and hard feelings and didn’t feel judged. I felt heard, respected, and understood. She skips the “drink green tea” and morning mantra BS and instead offers actionable skills. Heather has shifted how I think and how I show up. Her approach is individualized and customized to what’s going on for us, in our own lives and businesses. Heather sees us and her gift is in helping us see ourselves. Heather is an exceptional coach for leaders who want to have faith in making bold decisions. During a particular time of transition in my business, Heather helped me confidently re-assign team members to new positions, manage my fears around the structure change and helped me take my business to a whole new level in terms of work/ life balance. Heather is competent, smart and helps you, as a business leader, to set higher standards for yourself – and feel comfortable doing so. If you’re a business owner, looking to take yourself out of the weeds, make bold decisions and step into that next level ‘you’… you need to hire her today. Heather Gray gets you out of your own way, she strikes the perfect balance of being motivational and inspirational – WHILE keeping it real. There’s no room for buzzwords or or overhyped unproven tactics here. Heather’s years of experience are evident the moment you start chatting. She lasers in on precisely what’s keeping you stuck (which is probably not what you THINK it is) and maneuvers you around that mindset roadblock so you get back on track, FAST. If you’re ready to let go of the mindset junk which has kept you in “idle” for way too long – you’re ready for Heather. I’ve worked with Heather on several occasions, and each time, I have walked away feeling more confident and more in control of my thoughts and emotions. When I was feeling stuck in my business, Heather gave me practical steps to get out of a rut and move forward. When I had an attack of confidence before hosting my first live event, Heather helped me navigate those emotions. I came into my own at that event and a friend remarked on the noticeable difference in me. Heather is not afraid to call you out when you’re contradicting yourself or not being totally honest about your feelings. Heather is a true professional and she’s doing important work. Her clients reach hundreds and thousands of other people in the world, and like me, they’re even more impactful when they feel at peace with the way they move through the world. There’s no better guide for navigating those thoughts and feelings than Heather Gray. I hired Heather at an ultimate low point in my life when I was going through a lot mentally and needed support. I wasn’t sure what I was going to do or how to move forward. She gave me tools to come out of that place, one step at a time. Whenever I feel something negative, I just think about her being there for me and I feel better. Within 6 months, I honestly feel like a different person. I have become a different person, and Heather helps me navigate that. As my business grows, so does the pressure and challenges. Heather is my support system. She’s changed my life and my weekly call with her always leaves me feeling ready to take on the next thing that comes at me. Hiring Heather Gray was such a value add for our membership! Heather came into our members only group for a monthly business mindset training and spoke about a variety of topics that were relevant to our members. She also was available to answer questions and did this on a regular basis. Heather created such great content and discussion that we referred back to her training often. She offers a valuable service to business owners and entrepreneurs, especially those who have membership groups and want to provide a unique offering to their members to have more in depth discussion about business mindset and strategy. Since our intensive, I have gotten really clear on what kind of mom I want to be. My kids are doing better in school. They are happier and more confident. I am spending 1:1 time with them and my business is doing well. I have booked 3 new coaching clients. I have decided who I want to be and I am acting on it. I have gotten really purposeful and I have started a podcast. Thank you for getting me through this plateau. It’s energized me and has given me a lot of hope in my business and in my personal life with my friends, my children, and my family. Thank you so much. You haven’t come this far to only come this far.